Great Christmas, Birthday and Father's Day Gifts for the Fisherman!!! Below are selected fishing and outdoor gear items that make very unique and useful gifts for that special fisherman. 1-877-882-3255 or email him at pete@tals-fishing.com. 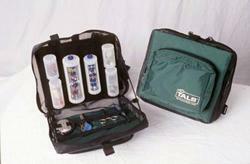 The TALS 500 Chest/Waist Pack System... is our most popular selling item. We designed and patented it ourselves and it has proved very popular with fishermen across the country. The twist action TALS Tackle Tubes give this system its flare. Fishermen who find this system useful are spin tackle fishermen who wade fish, surf fish, kayak fish, float tube fish, pond & stream fish, bank & pier fish, and canoe fish. To learn more about the TALS 500 please click on this link..... TALS 500. To purchase the TALS 500 please scroll down to the bottom of this page. Pack, strap system, and 8 TALS Tubes included as shown. Satisfaction guaranteed! The TALS 600 Fly Fishiing System... very similar to the TALS 500 above accept this system is designed for the Fly Fisherman. Specialized TALS Fly Storage Tubes come with this system. The Fly Tubes are TALS Tubes equiped with special rotating carousels inside. The carousel has Fly Grabber discs that secure and protect flies from hackle damage. The discs are water proof and tear resistant making them last for years to come. The ventilated tube acts as a continuous fly dryer when closed. A fold down work tray makes retying a snap. 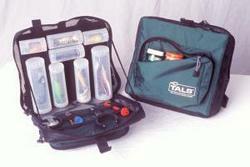 Click on link to learn more about the.... TALS 600. Scroll down to purchase. Satisfaction guaranteed!